A potential Achilles heel is in the data itself. A data-driven learning strategy aligns learning goals with the business and ensures the learning function is putting its design, manufacturing, and reporting capabilities to good use by working on high-value and high-impact initiatives. It also describes the relationship between the learning function and its two internal customer groups, business leader stakeholders and the learners themselves. A learning strategy differs from an operational strategy. An operational strategy for the learning function describes the current, near- and long-term capabilities and capacity of the function, as well as a roadmap of activities and milestones. Decisions regarding governance, technology, staff and staffing levels, using internal or external resources, reporting, etc., are guided by the operational strategy of the learning function. The data-driven learning strategy effectively uncovers and brings into balance the goals, needs, and realities of the organization, learning function, and the learner. It places strong emphasis on business alignment and business outcomes, ensuring learning strategy and learning outcomes produce needed changes to behavior and performance. For business leaders, data-driven learning strategy improves their confidence that the direction and focus of training appropriately reflect the business’ goals. For the learning leader, it provides a business-centric framework for prioritization, decision-making, and efficient deployment of L&D resources. For the instructional designer, it guides and focuses design choices. For the learner, it improves the odds that their learning experiences will meet important developmental needs, and be engaging and meaningful. In addition to aligning L&D to business goals and outcomes, data-driven learning strategy forecasts anticipated results with associated metrics and establishes a roadmap to guide the organization to those outcomes. It also provides numerous points of measurement that will indicate progress towards achievement of that state. To be effective, different kinds of data need to be identified, collected and analyzed in the early stages of learning strategy development. A data-driven learning strategy utilizes formal and informal data. Formal data: Most organizations today are awash in data, reports, and dashboards. Often gathered and organized automatically and behind the scenes, this type of structured data provides insights to financial and operational performance, highlighting gaps between expected and actual outcomes, and can be used in modeling or forecasting future state scenarios. In some cases, the data is unstructured and requires some effort to organize, consolidate and interpret. Formal data is useful in estimating and calculating actual business impact and return on investment (ROI). Informal data: Most organizations have this kind of data readily available as well; however, it’s not often captured automatically and typically requires manual effort to uncover and organize. Informal data is valuable in setting direction by capturing goals, clarifying priorities and trade-offs, establishing training design preferences, understanding tolerance for both risk and innovation, and confirming organizational constraints. Informal data is invaluable in forecasting a future state and aligning learning strategy to business goals. A potential Achilles heel of a data-driven learning strategy is in the data itself. While better than a learning strategy that is based on best guesses and hunches, incomplete, inaccurate or outwardly conflicting data will undermine the strategy from the moment data issues are uncovered. Poor quality or inaccurate data is an issue that’s hard to overcome after the fact. To ensure a data-driven learning strategy rests on a solid foundation, it’s important to ensure the data is sufficiently trustworthy to the stakeholders. Another potential pitfall is the paralysis that can come from too much data or the wrong data. A guiding principle is to uncover enough data to get the primary, or the majority of, stakeholders comfortable with the direction and substance of the learning strategy. Imperfect, yes, but practical. Performance Data: Performance data measures the actual performance of an organization, function, process or role, highlighting gaps and focal points for the learning strategy to address. This formal data covers operational goals, capturing things like units manufactured, cycle time, accuracy and errors, price captured, discounts applied, realized risks, cost of losses, etc. Additional gaps can be identified by looking at the data across time (e.g., months, quarters, or years). Stratifying, segmenting and isolating the data creates an understanding of variations that are common and uncommon. This kind of structured data can be used in a predictive way, by assuming certain changes and their impact. For example, “What would it mean if we were able to reduce errors by 15 percent? What would have to change to achieve that goal?” The data can then be used on the back-end as part of a Level 4 or 5 evaluation. Financial Data: Financial data provides balance sheet and internal P&L insights. It can also highlight where the organization is about to expand, make a directional shift, increase or decrease staff, invest in new technology, or phase out old technology. Tactically, it’s a good idea to include a finance person among the stakeholders (stakeholder data is a topic we’ll discuss in a moment). Rather than learn all the ins and outs of the financial world and risk being incorrect, work closely with the finance stakeholder to uncover key insights from the financial data. Work Analysis Data: For a functional, role-specific, or course-level learning strategy, specific work analysis data is crucial. Documenting the work outcomes, processes and tasks, measures, knowledge and skill requirements – and performance gaps – helps all the stakeholders understand the tactical targets of the learning strategy. Stakeholder Data: Stakeholders are often the primary source for uncovering informal, unstructured data through their insights into organizational goals, strategic direction, the organization’s tolerance for risk/innovation, and weighing in on decisions regarding priorities and trade-offs. Different leader stakeholders see the future differently. Partly due to their role, organizational home, or functional goals, these stakeholders provide unique and sometimes conflicting goals. They describe possibly divergent future states and different perspectives. As such, it’s best to engage multiple stakeholders to avoid being guided by a single perspective and, as a result, missing the mark. An effective learning strategy finds an appropriate and reasonable balance among the stakeholders. Whether a single view of the future is confirmed by each stakeholder, or multiple views emerge, a data-driven learning strategy accounts for the widest reasonable future state, and ensures it will be supported by a broad community of leaders. It’s often beneficial to include leader stakeholders with challenging, or perhaps contrarian, views of the future. They often speak for a community who, for whatever reasons, refrain from engaging. There are a number of ways to capture stakeholder data. When considered together, stakeholder data and work analysis data allow for traceability between specific learning outcomes and organizational goals. Learning Function Data: The learning function’s operational strategy, associated roadmap, and performance metrics will enhance understanding of the function’s capabilities and capacity, and will be an important input to the learning strategy. This data may also uncover organizational constraints to contend with related to skills, timeframe and budget. External Benchmarking Data: Though not a primary data source, benchmarking data provides insights into organizational performance of industry peers or across industries. Market comparison data provides insights into the actions, decisions, and spending of other organizations in specific areas. Sortable by industry, organizational size and other factors, it is often useful to understand how the organization compares to the market. Cognitive and Learning Research Data: Also not a primary data source, research data provides insight into the learning strategies, instructional modalities and tactical investments being made in the market. Today’s evolving global marketplace and increasingly competitive business environment require prioritization of organizational needs and goals, while ensuring that learning initiatives drive business results. 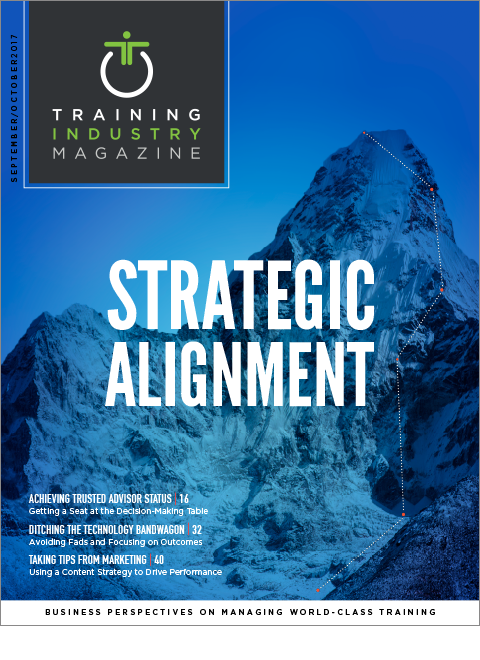 Successful companies understand the importance of designing, developing and delivering training programs and activities that meet those demands through strategic alignment with a focus on business outcomes and the bottom line. Talking to business leaders is one of the most important steps to aligning learning with the business. Engage leaders to gain their wisdom, insights, and judgment as well as their understanding of relevant data, strategic direction, and key operational goals as they shape training decisions and investments. Explore: Gather and analyze appropriate types of formal and informal data to understand the business goals. Target: Determine the right roles and right changes in performance to achieve the business goals. Define: Work as an internal team, guided by the input of subject matter experts or other representatives to define a learning solution that addresses the high-priority areas, goals and gaps. Additionally, make sure it fits within the organizational “realities” of timeline, budget and design preferences. Confirm: Review learning solutions with the stakeholders and demonstrate the traceability of learning outcomes to priority business goals – adjust as needed. Since the L&D function is in the “hot seat” when it comes to balancing the needs and goals of the organization, the learning function, and the learner, using a data-driven learning strategy ensures L&D is focused on high-value and high-impact initiatives. Brian Blecke and Kelly Smith are founding partners and performance consultants at Actio Learning. With 25 years’ experience, they are passionate about helping organizations design and deliver innovative learning and performance improvement solutions to address workforce challenges.